Mr. Poitier is one of my favorite people in the world. I adore his elegance, his eloquence, his undeniable charm, and of course, his work. This book "offers inspirational advice and personal stories in the form of extended letters to his great-granddaughter." He says, "I was moving toward the end of a journey, my thoughts unfolded next to consider all of the history that had transpired before my own arrival and hers," taking in his great-granddaughter Ayele, just two days old at the time. Realizing there is the possibility he won't be around to tell Ayele stories of his family and his roots, his letters would, in the form of a book she can pick up anytime and "hear" his words, convey his story and her history. 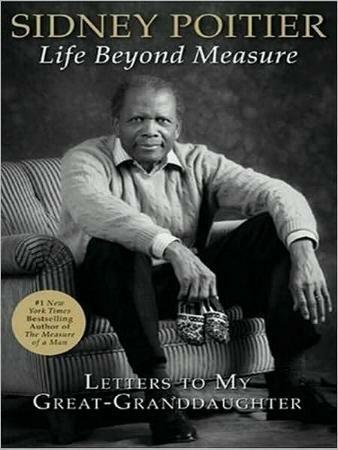 Mr. Poitier's book is not limited to personal and family history; he throws in a few other snippets for his great-granddaughter to absorb, to put time into perspective. For example, he mentions the beginnings of the camera, his take on religion and God, racisim, heroes, electricity, cars, and fear among other subjects. All the while he imparts sage advice, and at the same time reveals a little more about himself and how he coped in certain situations. Lessons we can all learn from. I wish everyone would read Poitier's ninth letter, Taking A Stand. I loved the poignancy, the backbone and guile, determination, and the kindness of others he talks about. "One of my few advantages in weathering the storms ahead was that even by age fifteen I had a core of knowledge that was going to travel with me - a sense of who I was, regardless of what the world chose to say to me," spoke volumes to me, as did the common sense of "But what good is a thriving economy to a dying public." My kind of reasoning. Of course this book is not only for Ayele, it's for all of us. Thank you. Conclusion - Dignity personified is Mr. Poitier. This book is like a handbook to life. Essential reading.